To celebrate its 150th anniversary, the world’s third-oldest chess club, Stockholm’s Chess Society, organized one of Sweden’s strongest chess events ever, the Hasselbacken Open (www.HasselbackenChessOpen.se). This 450-player, nine-round Swiss featured 34 grandmasters and 13 international masters. The top two seeds were Dmitry Andreikin of Russia with a FIDE rating of 2736 and the legendary “Fire on Board” specialist, Alexei Shirov of Latvia. The field also included two Americans, 15-year-old Sam Sevian of Southbridge, Mass., and 13-year-old Awonder Liang from Minnesota. To get warmed up, Sevian played a 20-board simul the day before the tournament, winning all the games. In the tournament, he showed a new found maturity, playing one his best events ever. He was undefeated with 6.5 points, playing six grandmasters, drawing all but Shirov, whom he beat in a very exciting game. He gained 13.5 rating points, which pushed his rating over 2600 for the first time. He finished in 15th place on tie-break, but he was bested in finishing place by Liang, who finished in 13th with 7 points, again on tie-break. Though he finished higher than Sevian, Liang had a poor event. He played only one grandmaster, lost in the second round to an “A” player, and gained no rating points. The eventual tournament winner was Andreikin on tie-break over Baskaran Adhiban of India. Andreikin’s victory earned him 50,000 Swedish krona, or $6,136.50. 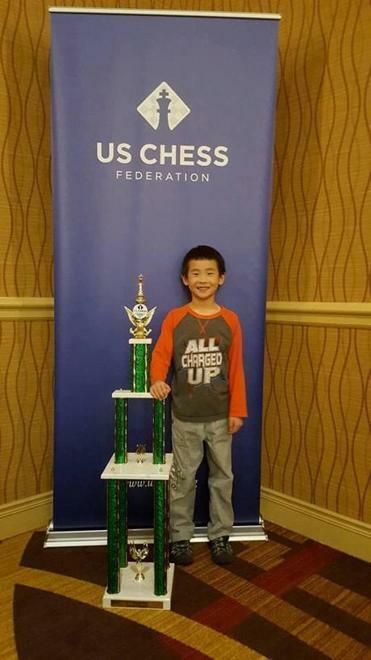 Ryan Wang of Sharon won the K-1 championship at the National Elementary Chess Championship in Nashville. The National Elementary Championship had just concluded in Nashville with a whopping 2,260 players. The best Massachusetts player by far was Ryan Wang, who won the K-1 championship section with a perfect 7-0 score. Ryan lives in Sharon and attends the Sage School in Foxborourgh. The next best Massachusetts result was Danila Poliannikov, who finished in 11th place in the K-6 section. Dani also lives in Sharon and attends the Heights Elementary School there. The other best New Englander was Connecticut’s Maximillian Lu who finished 2nd in the K-1 championship section. Winners: Waltham First Friday #157: 1st-3rd: Denys Shmelov, Todd Chase, Ilya Rozonoyer: 4-1; 94th Chelmsford Burger King Scholastic: 1st: Advait Bhowmik: 4-0, 2nd-4th: Sritan Devineni, Jeremy Gu, Rory Liao: 3-1; Kaamatan Open: Open: 1st-3rd: Chris Chase, David Vigorito, David Carter: 4-1, Under 1600: 1st-2nd: Michael J. Meehan, Walter Whitmore: 4-1. Coming events:May 20, Boylston Friday Night Action, 40 Norris St., Cambridge, www.BoylstonChess.org; May 20, Waltham CC’s Euwe G/5 d0 (blitz), WalthamChessClub.org/Schedule.html; May 21, Legends of Chess: Lajos Portisch, Boylston, Cambridge, www.BoylstonChess.org. Answer to today’s problem: 1.Bc6! wins as 1…QxQ leads to mate after 2.RxB. 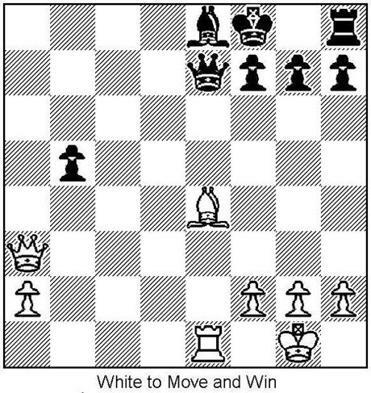 And QxR is illegal by the rules of chess — the queen is pinned to her king!